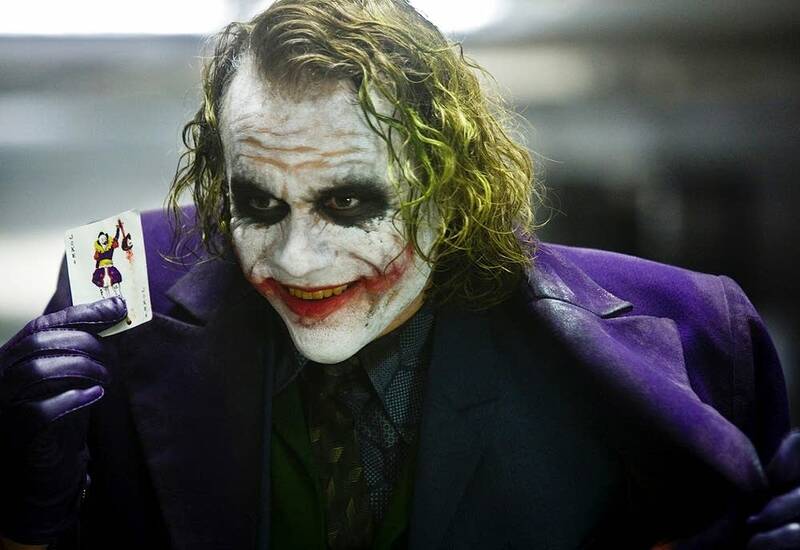 Heath Ledger as the Joker in "The Dark Knight" Warner Bros.
Today the Walker Art Center kicks off a three-week celebration of one of the hottest, most acclaimed directors working today. Christopher Nolan: Moving Through Time begins tonight as Nolan joins Scott Foundas for a conversation that marks 25 years of Walker Dialogues and continues in a series of screenings of Nolan's films — starting with Following on Thursday and ending with The Dark Knight Rises on May 24. The films are not being shown in strictly chronological order, but rather arranged to climax with the Batman Trilogy, each of the films screening on one day of the final weekend. This will, of course, benefit those who may have not seen the Batman films — or want the opportunity to see them again in the theater in order. The series provides an opportunity to consider the history of not only Nolan as a director but the sound of his movies — specifically how his scores have changed as he moved away from composer David Julyan and into a collaboration with Hans Zimmer. Christopher Nolan's first four films — Doodlebug (a 1997 short), Following (1998), Memento (2001), and Insomnia (2002) — were scored by David Julyan. Julyan is also credited for sound and acting in Following. Nolan and Julyan came up in the film world together, meeting each other at University College London and joining the Student Film Society there. Julyan's approach fit beautifully with Nolan's early work. They were slow, calm, and character-based. Julyan has never been a grandstander as a composer and has often hewed to ambient textures as he blends electronics with orchestra. The feel of Nolan's films that audiences attached themselves to in the late 90s and early 2000s was the feel of David Julyan. Reminiscent of Angelo Badalamenti's work, especially in the films of David Lynch, there is something incredibly inward about Julyan's composition style. Julyan often uses strings to build agitated textures; this highlights the inner lives of Nolan's characters. Look to Memento, the first major feature film for both, for an intense examination of its protagonist's emotional turmoil. After Insomnia, which was his first movie for Warner Bros., Nolan was able to develop the narrative that became Batman Begins (2005). For the Dark Knight's first outing since Joel Schumacher's disastrous Batman and Robin (1997), and Hans Zimmer and James Newton Howard were brought on to score the film together. Batman Begins really changed the Christopher Nolan landscape, as the soundscape developed by Julyan evolved under the percussion-driven force that is Hans Zimmer. Starting with Batman Begins Nolan's films become much more about kineticism and action setpieces. His sound mixes started to have more high and low ends without much middle ground — to the chagrin of many. David Julyan returned one more time to score The Prestige (2006), a film that some argue is Nolan's best. The Prestige is a true collaboration between these two talents, and evidence of why Julyan is such a beautiful composer. He finds themes and minimalistic expressions that add dimension to what's on the screen without distracting from the narrative. The film is all about the story you don't see, and Julyan's ability to speak compositionally to a multilayered conception of reality beautifully matches the staged feel of this historical drama. Zimmer and Newton Howard teamed up again for The Dark Knight in 2008. Whereas the first Batman film seemed more of a true collaboration with Zimmer's percussionistic propulsion balanced by the elegance and soft strings of Newton Howard, for Dark Knight the two seemed to split duties — with Zimmer handling the more Joker-driven themes and Newton Howard creating the music associated with Two-Face. It's a clever way to divide and conquer — a method used by two different composers for the new Avengers: Age of Ultron. The method allows for the range of multiple composers without running the risk that one person will be overrun by the other. The Dark Knight also features a big bank-robbery opening that became a showcase for Zimmer's desire to push the sound barrier. Music and sound really drove the narrative of those opening moments, which had relatively simple visual setups — a challenge for Nolan as well. After this it's Zimmer all the time for Nolan — to the point of controversy. Many viewers have seen Nolan's films as growing increasingly loud and unbalanced, driving characters from action setpiece to action setpiece. Just this past year Nolan had to respond publicly to people calling out his efforts with Interstellar by reiterating that the sound mix isn't just made by Nolan and Zimmer in a room alone together: they have a team who all built something they thought was unique and valuable. Whether you're a fan or not, it's clear Nolan has evolved — and with that evolution, so have the scores of his films. Many filmmakers develop close collaborations with composers, and Christopher Nolan's work is now very much a platform for Hans Zimmer's boundary-pushing musical experiments. Together, Nolan and Zimmer have redefined the look and the sound of a blockbuster movie — but in achieving that grandeur, Nolan also shifted away from a composer who gave his narratives a very different treatment. What would The Dark Knight, Inception, or Interstellar have sounded like if scored by Julyan? It's an interesting question to contemplate as you revisit Nolan's impressive filmography.